Thallus: placodioid, clearly forming rosettes, 2-4 cm wide, tightly to loosely adnate, lobate peripherally lobes: flat to convex and then sometimes folded, up to c. 6 mm long and 0.3-1.5 mm wide upper surface: bright yellow to golden yellow to red orange, smooth to somewhat rugulose, sometimes somewhat shiny upper cortex: 10-20 µm thick medulla: white, not inspersed with granules lower cortex: 20-30 µm thick under lobes tips but absent centrally or absent throughout lower surface: yellow peripherally but becoming pale centrally; hapters: sometimes present, stout, peripheral Apothecia: common, sessile to substipitate, up to 1.5 mm wide; margin: smooth, becoming crenulate with age; disc: darker yellow than the thallus, sometimes with a greenish tinge; epithecium: c. 5 micro meter thick; hymenium: c. 45-55 micro meter tall; paraphyses: simple, cylindrical or with somewhat swollen, up to 4 micro meter wide tips; hypothecium: c. 60-70 micro meter thick asci: 8-spored ascospores: narrowly ellipsoid to weakly kidney-shaped, 11-15 x 4-5 micro meter Pycnidia: frequent, globular to broadly ellipsoid, immersed or appearing as raised warts on the thallus surface conidia: narrowly ellipsoid, 2-3 x 1.5 micro meter Spot tests: upper surface K+ reddish C- KC- P-; medulla K+ reddish, C-, KC-, P- Secondary metabolite: calycin. Substrate and ecology: on calcium free rocks and boulders in open habitats World distribution: central Mexico to southwestern USA Sonoran distribution: one of the more conspicuous and common lichens in the interior desert and extending up to at least 2600 m in the mountains of Arizona, Chihuahua, Sonora, Sinaloa, Baja California and Baja California Sur. Notes: Candelina submexicana is morphologically very variable. 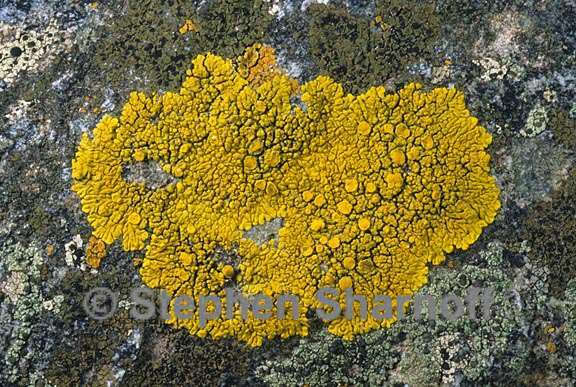 The variation ranges from more or less crustose forms with flat and tightly adnate lobes to subfoliose forms with convex lobes similar to C. mexicana. The two species are easily separated by the color of the medulla.